Eri Takase has been doing custom Japanese Kanji Symbol Designs for over fifteen years. If you are looking for professional designs custom ordered to meet your specific needs then we would love to work with you. Consumers have become increasingly sophisticated and poor quality calligraphy is likely to have a negative impact. Put another way, with the widespread use of kanji in the marketplace, consumers have learned to appreciate and respect beautiful and well-crafted designs. r fifteen years. If you are looking for professional designs custom ordered to meet your specific needs then we would love to work with you. 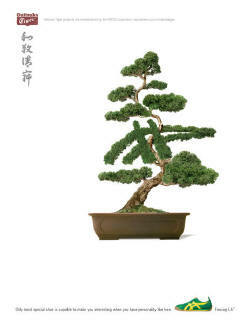 StockKanji.com is a catalog of over 5000 hand-lettered designs by Master Japanese Calligrapher Eri Takase. If you are looking for a ready-made illustration we have thousands of designs ready for immediate download with your order. Each design having three formats suitable for commercial use: 72 dpi, 300 dpi, and 600 dpi JPG format. On the left is one of nine designs for Beauties of Nature (kachoufuugetsu). This four character idiom means the beautiful things in nature and is composed of the kanjiflower, bird, wind, and moon – what Japanese consider to be the most beautiful aspects of nature. Our designs are carefully researched and documented – often providing independent dictionary references as well as other on-line references so you can be absolutely sure that the designs are as accurate as they are beautiful. Each design is hand-lettered by Master Japanese Calligrapher and then professionally scanned to give the best images possible. This is why the best advice you can have is to find the very best Japanese Calligrapher that you can. Master Japanese Calligrapher Eri Takase is specially trained as a professional calligrapher and has over ten years experience in commercial calligraphy design. To see examples of Eri Takase’s designs scroll down to see several book and CD covers that incorporate her beautiful calligraphy designs. To create the best possible design you will be working directly with Master Takase and both native English and Japanese translators who will provide as much (or as little) documentation as you need to be comfortable with the translation. Using your description, Master Takase will start by creating an initial set that includes translation options and sample designs that show how the translations might look in the design. Each design set, including this initial set, is hand-lettered by Master Takase. And with each set we are happy to provide you with as much documentation as you need to be completely comfortable with the translation. With your feedback we should have a good idea of what is working well and will then incorporate your feedback into a new design set. We continue to work with you, showing designs with explanations and getting your feedback until the design is just right. Normally this takes two or three sets of designs. We offer a variety of options for the delivery of the final product. The basic offering is for digital delivery of the design as a high resolution JPG file. Though we can provide the design in other formats (e.g. PSD, or TIFF) email. We also have options for mailing the original design, or one can select both of these delivery options. We also offer optional matching artwork by Master Takase that is on handmade Japanese paper. Because these are hand-made works of art, the match will not be perfect but every effort will be made to match the original. Optionally matching artwork, suitable for framing may be ordered. Please feel free to Eri@Takase.com with any questions and we look forward to the opportunity to work with you. For these designs we had the pleasure of working directly with the author, Diane Rosen. We originally created seven designs, five of which were selected to use in the book. From initial contact to the final artwork being mailed to the book designer Anne Ricigiano took four days. In the above design we used a design for chawan meaning tea bowl or vessel. Ms. Rosen initially presented us with a short list of words she wanted. We offered several options for the translations and based on her feedback were able to narrow down the list of words and focus on the font. The result is a beautiful book with illustrations that intimately capture the author’s aesthetics. Learn how the hard-style karate that became shotokan took shape in 19th century Okinawa as an embattled king with an unarmed force of bodyguards faced an armed invasion from overseas. In this new 328-page book, author Bruce D. Clayton, Ph.D., uses rare sketches, footnoted historical research, archival lithographs, period photographs and contemporary technique demonstrations to reveal shotokan’s deadly intent and propose modern practical applications of such knowledge. Achieve a new level of theoretical understanding and fighting ability by learning Shotokan’s Secret for yourself! In The Little Wabi Sabi Companion, Diane Durston, a noted writer on Japanese art and culture, presents a collection of reflections, along with classic poetry and verse from both Eastern and Western traditions, that capture the wabi sabi moment, and inspire readers to do the same. The subtle beauty of nature, the simplicity of a found object, the impermanence of an autumnal flower arrangement, the solitude of a single fisherman in his boat are all celebrated and reflected upon in this easily browseable book. 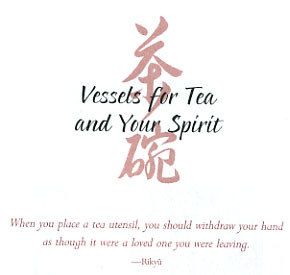 The text is complemented by photography and calligraphy inspired by the wabi-sabi spirit. This collection of simple, yet profound insights in an irresistable, hold-in-the-hand package offers readers the opportunity for integrating moments of contemplation and meditation into their daily lives, and to discover the essence of wabi sabi. For the perfect Japanese tattoo designs visit our own Japanese Kanji Tattoo site which features over ten thousand original designs by Master Takase – original designs available nowhere else. These carefully researched and beautifully hand-lettered designs come with the line art that your tattoo artist needs to ink the design. Just order and print and take to your tattoo artist. We give you everything you need for the perfect Japanese tattoo – your tattoo artist does not even need to know Japanese. And all designs can be instantly downloaded so you can get your Japanese tattoo today. Not only can you get a design from a name you trust, but you can get it now! One of the most fascinating art forms woven into the fabric of our society, is the Martial Arts. People study or do this for various reasons, from improving human vitality, strengthening their inner spirit, to finding balance and peace through the warriors way. But the warriors way is rapidly changing for the worse, due to the conduct of many martial artist who are in pursuit of recognition, wealth, fame and fortune in this modern era. All true martial forms, are but the sign that points the direction for the seeking practitioner wanting to attain the proper essence, code of conduct in modern society. Touhkondo is one such code that emphasizes the need for modern martial practitioners to re-evaluate their chosen methods and rediscover their true purpose by cultivating humility, compassion, valor, dignity and mastering their fighting spirit through harmony and respect not over another, but over the “Self”. Simply a beautiful Jazz album. The calligraphy for Love (ai) is ghost imaged adding a subtle but distinctive connection to the Japanese roots of the design. StockKanji.com – Stock Japanese Calligraphy Designs features eleven designs for Love in a variety of fonts including two designs each in block, cursive and semi-cursive. Also original designs as well as the rarer clerical and seal script are offered. The Takase Shodokai Learn Japanese Calligraphy Series provides the in-depth instruction needed to master Japanese Calligraphy. Starting with tool selection and proper usage, Takase Sensei guides the student through the fundamentals of Japanese Calligraphy using a combination of text, sample works, audio, video and frame-by-frame analysis. By using this multi-media approach, Takase Sensei is able to teach Japanese Calligraphy in a way that is not possible with books alone. Being able to see the rhythm of the brush along with proper hand position and posture is essential to learning good technique and each CD-ROM contains over thirty videos and hundreds of photos. Each lesson introduces one or more characters along with the usage, pronunciation and a word list. The calligraphic aspects of the character are shown in detail including a printable sample and an annotated version showing the stroke order and proper brush movement. A video showing Takase Sensei brushing the character is presented. This video demonstrates proper brush movement, hand position, and technique. Following the video, every aspect of brushing the character is discussed in a frame by frame analysis of the video. Sample student works are also presented along with a detailed critique and corrections by Takase Sensei. The problems and corrections presented are those most commonly made and will help the student identify and fix similar problems. This gives the student an opportunity to see what is considered wrong, why it is wrong, and how the fault can be corrected. 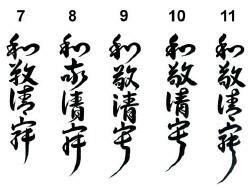 Calligraphy Lessons 7 – 12 continues to focus on the basic strokes of the Kaisho (Block) script. Eri Takase worked with Art Director Bill Stowe of Vitrorobertson on a project for Asics America Onitsuka Tigers Athletic Shoes. The design used was the Four Virtues of Tea read “wa kei sei jaku” and is featured prominently in the upper left of a series of advertisements. Several designs were presented and Mr. Stowe ended up selecting design (7) from the second set of samples. With this the final artwork was delivered digitally. The entire process, from first order to final design took only two days. Mr. Stowe appreciated the rush as he was on an extremely tight deadline. Not all designs go this quickly, but in a pinch it is good to know Takase Studios can meet your deadline.